As I have been continuing to put endless final touches on our nursery, I came across two that also incorporated the blue and orange from the Serena and Lily Ben line. Will I ever stop looking at nurseries? Nope, probably not. They might be my new favorite room to decorate! This second one is my favorite of all nurseries I have seen. 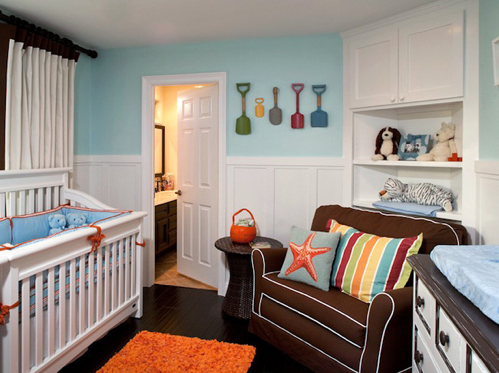 Once we move into a bigger home (likely never) I might bring this punchy approach to nautical into our son's next room. I love the vintage looking beach toys hanging on the wall!